Learning is best when it’s fun, meaningful – and incognito! With a little help from technology, you can cleverly disguise important school readiness skills to help prepare your child this year. Here are some helpful tech tips to give your young child a jump start on five important early literacy skills they’ll need for school. So plug in, power up, and let’s go! 1. Letter Recognition. The keyboard is like a game in itself: it’s the entire alphabet all mixed up! Open up a word processing program, and play a game to race your child to find each key in ABC order. 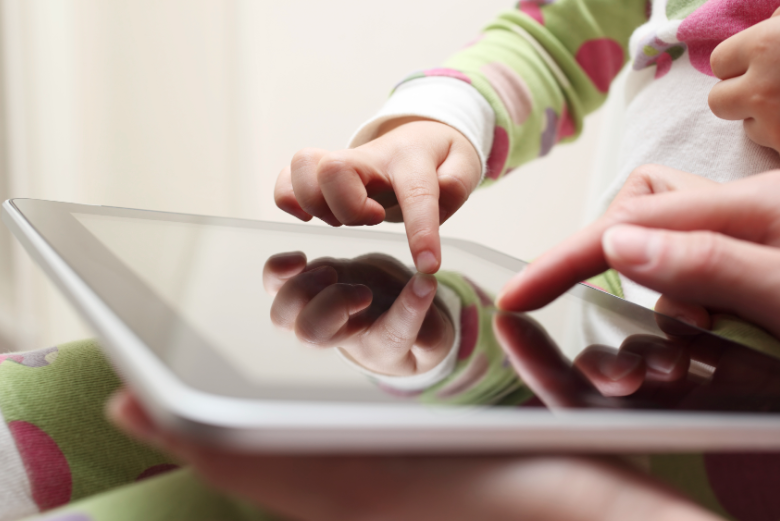 Hover your finger over the right key, so your child’s eye goes to that section of the keyboard. Let her beat you by a split second. You know you’re playing it correctly when it turns into a giggle-fest. 2. Beginning Sounds. As kids use the keyboard, you can reinforce the sounds of those letters. You can start simply by having your child type her name, sounding out each letter. Move on to other family members’ names (kids are very proud to spell siblings’ names) or even simple words, like C-A-T and D-O-G.
3. Writing Skills. Talk to your child about what he likes about school, and let him choose his favorite recent highlight or event. Open a basic paint program and have him draw a picture about it. Picture-drawing a story is a precursor to writing a story. Let your child dictate a story about what happened that day: Focus on the beginning, middle and end to help promote storytelling and writing. Write a sentence on paper, then have your child type it into the computer. 4. Reading Readiness. Open up a word processing program and write a simple rhyming word, such as HAT. Let your child type as many rhyming words as possible (CAT, FAT, MAT…). Focus on left to right eye movement as you rhyme, since both of these skills will be a big help with reading readiness. 5. First Name Recognition. Use any keyboard to teach your child how to type her first name. Her name will be on new cubbies, name tags and all over the place in school. You’ll help build visual discrimination skills when she can identify her name from others. When your child completes the fun activities for the day, celebrate her achievements with the best kind of reward – doing something else that’s fun together – such as unplugging to go play outside! Online Deal: Up to 50% for our students! Laura St. John is co-creator at Discovery Kids Puterbugs, the largest provider of computer classes for kids, a proud partner. In addition to online membership, classes are also taught by certified trainers at select locations. For more information on class schedules near you, please e-mail classes@puterbugs.com.